I’m posting these in honor of Presidents’ Day, but really, does a girl need a holiday or even an excuse to eat chocolate. Why give up something so tasty and full of antioxidants? Of course, make sure it’s vegan, gluten-free and not loaded with processed ingredients or saturated fats. I whipped up these yummy little sweets in just a few minutes. They’re super chocolaty, slightly sweet, easy to make and good for you! Blend cocoa powder, almond butter and dates in food processor with “S” shaped low blade until all ingredients are mixed into a doughy ball. You may need to stop the process and scrape sides of bowl until every thing mixes. If your mixture is dry, slowly add a very small amount of water until it reaches the right consistency. Shape dough into 1″ balls and roll balls in chopped almonds. Serve or store in airtight container. Makes about 2 dozen bonbons. 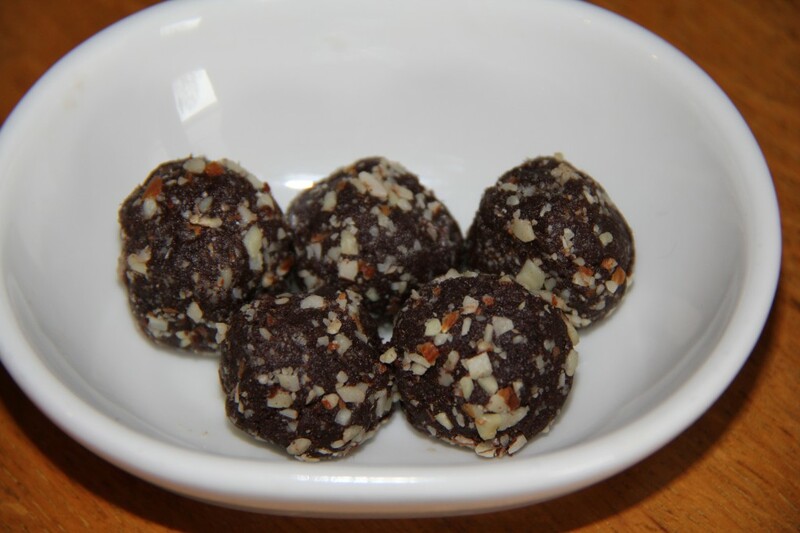 This entry was posted in desserts, Recipes and tagged almonds, bon bon, bonbon, chocolate, cocoa, dessert, gluten-free, healthy, raw, recipe, vegan, vegan cooking, vegan recipes. Bookmark the permalink.